The history of KRAB can be traced from KPFA to Washington, DC, and finally Seattle. 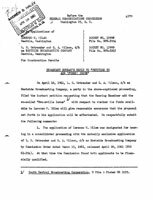 Some documents can be found in the archives of the law firm of Haley, Bader and Potts (HB&P), which represented Lorenzo Milam and the Jack Straw Memorial Foundation from very near the beginning. Other events may exist only as brief announcements in Broadcasting Magazine. 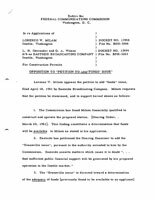 Read Lorenzo's account of the Washington, DC application and how it was stonewalled by the FCC at The Plot To Save The World, parts 1 and 2. 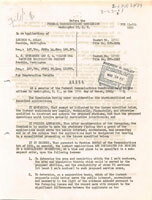 Many documents are in pdf format. To read them, click on the thumbnail to open and adjust the size. 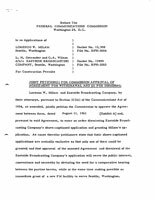 Broadcasting Magazine - The FCC announced on Oct 9, 1959 that Lorenzo Milam and Gary Margason (the Paduan Foundation) filed an application for a station in Washington, DC. 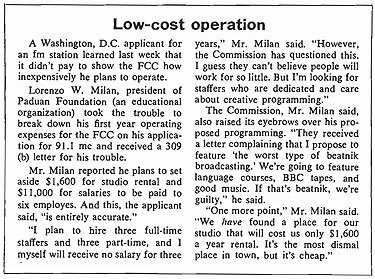 Broadcasting Magazine - Lorenzo optimistically places an advertisement for an engineer for the Washington, DC station. Broadcasting Magazine - And another ad for studio equipment. 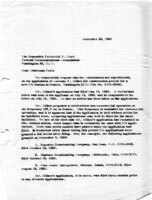 Broadcasting Magazine - The FCC sends a "309(b) letter" if, in their opinion, they have found a deficiency in the application. This may result in requiring a hearing, and can delay action on an application for 30 days, allowing "parties of interest" to file petitions to deny the application. Not having access to these documents, we cannot say what the deficiency might have been, but the article seems to say that the FCC might have considered Milam's financial estimates unrealistic. 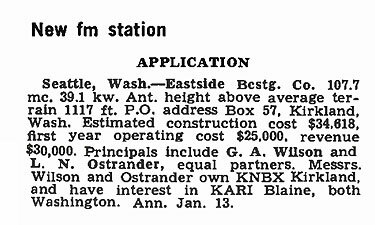 This is the last time the Milam-Margason application for a DC station is mentioned in Broadcasting Magazine. 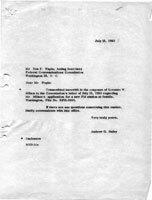 The earliest document in the HB&P archives is the engineering section of the application for an FM station for Seattle, Washington prepared by Lorenzo Milam and engineer Nugent Sharp, and filed with the FCC on this date. 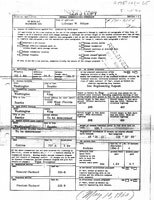 The FCC assigns file number BPH-3004. They have applied for an effective radiated power of 14.8 kw, and effective height above average terrain of 186.3 feet, using a Collins 737A transmitter. No, it says nothing about KRAB. The call letters came later. Note that the antenna was to be located on the tower of KOL, then on Harbor Island. Broadcasting Magazine - On May 16 it is announced the FCC accepted an application for a station in Seattle, Washington, on 107.7 mc. 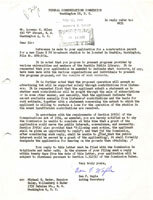 This is referring to the application of May 10, 1960. 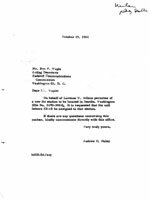 Another 309(b) Letter - Next is a letter from Ben F Waple of the FCC to Milam. 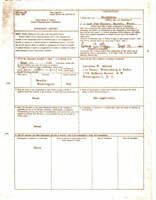 The copy we have was the carbon sent to Michael Bader of Haley, Wollenberg & Bader. It would seem that Lorenzo had retained a law firm to represent him before the FCC. The letter requests details as to the programming plans for the station, and information as to how the station will be funded and to what degree the licensee will absorb a loss if contributions are insufficient. This is probably similar to letter referred to in the Broadcasting of Feb 8. Milam writes back to FCC, explaining that he has not pursued program development and had no intention of doing so before the license is granted, unless the FCC makes that a requirement of all potential licensees. He sites Lewis Hill's estimation of what funds can be anticipated from listener-subscribers, and offers $75,000 to underwrite the station for up to three years. Not having heard anything from the FCC since Jul, and noting that other stations that filed for licenses three months after Lorenzo's application was submitted have had their licenses granted, Andrew Haley writes to the FCC asking that the FCC act upon the application "expeditiously". Broadcasting Magazine - A blind ad appears for a Collins 737A transmitter. WFLN? 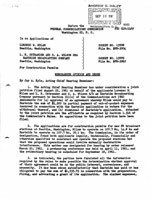 Broadcasting Magazine - Another month passes with no action by the FCC, but on Jan 13, 1961 the FCC accepted for filing another application for a new commercial FM station on 107.7, submitted by a G A Wilson and L N Ostrander doing business as Eastside Broadcasting Company. Perhaps this is the explanation for the delay in approving Lorenzo's application. Had the FCC been stalling to give Eastside an opportunity to file their competing application? Two months later, the FCC orders a hearing to determine which applicant should be granted the license. The next five months are taken up with negotiations between Milam and Eastside, and repeated postponements of the hearing to allow the negotiations to proceed. In Apr the negotiations are punctuated with an attempt by Eastside to dispute Milam's financial qualifications. Milam responds to Eastside's attempt to enlarge the issues of the hearing. The FCC denies Eastside's Petition and reiterates that Milam is financially qualified. The negotiations resume, but Eastside would seem to have lost confidence in the likelihood of prevailing in hearing. Broadcasting Magazine - A blind ad appears offering a lease of a Collins 737A transmitter. WFLN? Broadcasting Magazine - It is announced that a WFLN, Philadelphia has been granted a license for a new transmitter (replacing their 737A). The negotiations have arrived at a settlement: In exchange for Eastside withdrawing their application, Milam will recompense Eastside for their out-of-pocket expenses up to $1,500. A joint petition to the FCC is prepared and submitted. Milam files an Ownership Report. 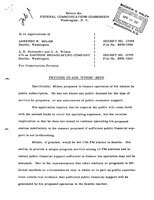 Andrew Haley writes to the FCC requesting that the call letters K-R-A-B be assigned to the new FM station in Seattle, file number BPH-3004. This should resolve any outstanding stories about how these call letters came to be assigned to Milam's first station.